I am now closing in on the completion of my doctoral studies from Reformed Theological Seminary in Orlando, and have just received news that my dissertation is headed to the second reader, and soon thereafter, onward to the defense portion. My topic has been narrowly focused on Jonathan Edwards’ theology of joy. For anyone who has ever attempted to read Edwards, they will find his writings just dripping with joy-related language: happiness, rejoicing in Christ, the joys of heaven, the mutual love within the persons of the Trinity. Joy is everywhere! Rich language of light, the sun, fountains, rivers, and streams all emit Edwards’ theology of Christian joy. I’ve read deeply and broadly: books by Edwards and books about Edwards. I’ve read his treatises, sermons, and personal correspondences. I’ve read biographies about him and at least one biography from his own pen (David Brainerd). Everything is so good, it’s hard to pick. Nevertheless, I am going to attempt to recommend just one shelf-full of JE books. Here then, are my top ten recommended works from or about the Northampton Revivalist (in no particular order). 1. Sermons of Jonathan Edwards. (Peabody, MA: Hendrickson. 2005). If you are looking to find some of Edward’s best sermons like “Sinners in the Hands of an Angry God,” “A Divine and Supernatural Light,” or “God Glorified in Man’s Dependence” this is the place to begin. [Reading Level: Moderate]. 2. Sermons by Jonathan Edwards on the Matthean Parables: True and False Christians (On the Parable of the Wise and Foolish Virgins). (Kenneth P. Minkema, Adriaan C. Neele, and Bryan K. Kimnach, eds. Vol. I. Eugene, OR: Cascade Books. 2012). What’s neat about this volume, is that unlike the above, this one is filled with previously unpublished sermons that just came into the public eye in 2012. [Reading Level: Challenging]. 3. Charity and Its Fruits. (Carlisle, PA: The Banner of Truth. 2005. Orig. pub. 1852.) Another of his major sermon series, converted into a treatise, this one focuses on the “love chapter” of 1 Corinthians 13 and features the glorious sermon “Heaven is a World of Love.” [Reading Level: Moderate]. 4. The Religious Affections. (Mineola, NY: Dover. 2013. Orig. pub. 1746.). Likely Edwards’ most well-known treatise, this book looks at the powerful inclinations of the heart (love, joy, fear etc.) and uses them to help determine which religious experiences are true and which are false. A major work tied to the Great Awakening revivals of the 1740’s. [Reading Level: Difficult]. 5. God’s Passion for His Glory: Living the Vision of Jonathan Edwards. With the Complete Text of The End for Which God Created the World. (Jonathan Edwards and John Piper. Wheaton, IL: Crossway, 1998. Orig. pub. 1765.). In this book, beloved pastor John Piper walks readers through JE’s easier-than-you-might-think treatise on God’s motivation for creating the universe. Hint: joy! [Reading Level: Moderate]. 6. Jonathan Edwards: A Life. (George Marsden. New Haven, CT: Yale University Press. 2003). Here is a 500 plus page work that masterfully takes readers through JE’s life and times. I cannot imagine doing serious study on Edwards without this volume. Another honorable mention in this category is Iain Murray’s work of a similar structure. [Reading Level: Moderate]. 7. A God Entranced Vision of All Things: The Legacy of Jonathan Edwards. (John Piper and Justin Taylor, eds. Wheaton: Crossway. 2004). Many crisply written essays on Edwards and his theology from men like John Piper, Sam Storms, Mark Dever, and more. [Reading Level: Moderate]. 8. 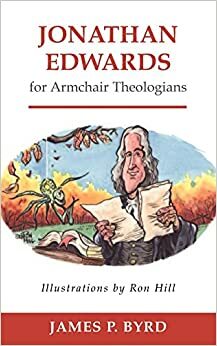 Jonathan Edwards for Armchair Theologians. (James P. Byrd. Louisville: Westminster John Knox Press. 2008). A great little introduction to Jonathan Edwards with cartoons sprinkled throughout to help readers “get it.” Really! There are cartoons! [Reading Level: Entry]. 9. God’s Grand Design: The Theological Vision of Jonathan Edwards. (Sean Michael Lucas. Wheaton: Crossway. 2011). An excellent little introduction of about 200 pages to Edwards’ life and major thought categories. [Reading Level: Entry]. 10. Edwards on the Christian Life: Alive to the Beauty of God. (Dane Ortlund. Stephen J. Nichols and Justin Taylor, eds. Wheaton, IL: Crossway. 2014). A very helpful book that focuses primarily on Edwards’ view of beauty but also considers: prayer, temptation, Scripture, gentleness and more. [Reading Level: Entry]. Sweeney’s Edwards the Exegete and Robert Brown’s Jonathan Edwards and the Bible? Too many good choices! JE fans are blessed.